It is not fully lined so it is lightweight. French seams make it super sturdy, it will even hold 2 gallons of milk! 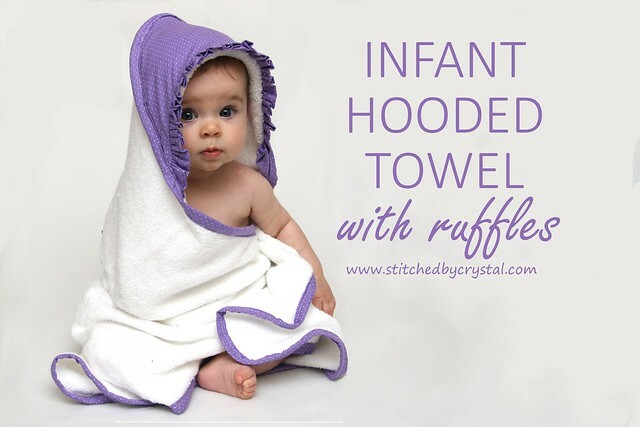 I added a small piece of elastic at the bottom so it can be easily rolled up and tucked away in my diaper bag. It is perfect for trips to the store, bringing packages to the post office, carrying books home from the library... I love this bag! 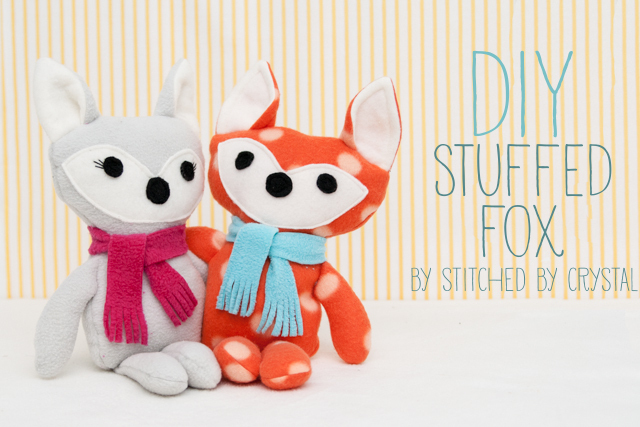 Start by downloading and printing my pattern found in the link above. 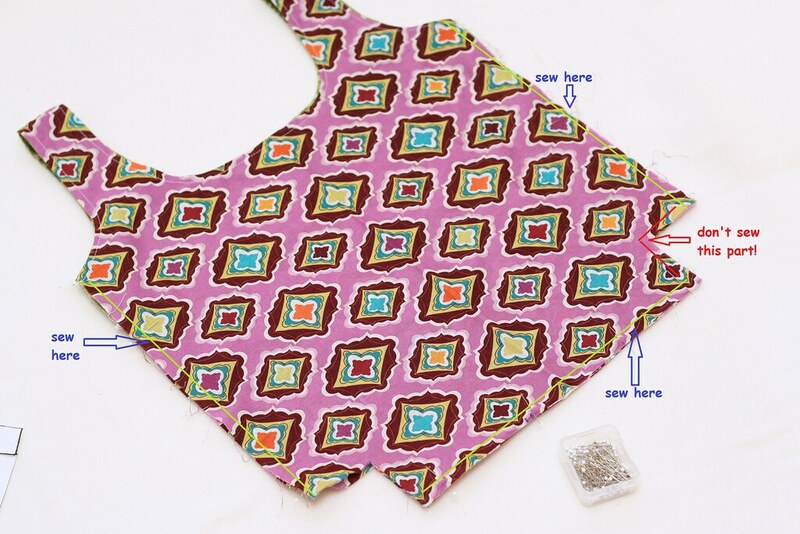 Cut out the pattern pieces and tape them together by following the directions on the pattern. You can overlap them a bit. 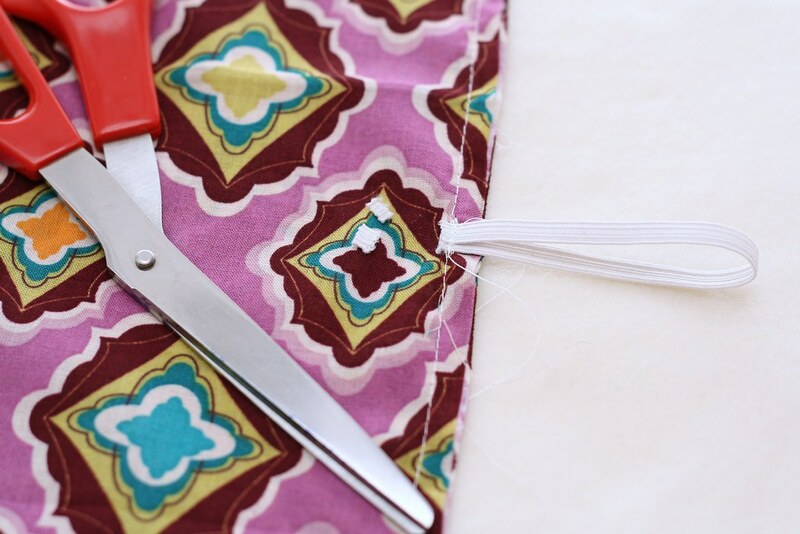 Stack your fabric for the outside of the bag and fold it in half longways (this way you only have to cut once). Iron along the fold. 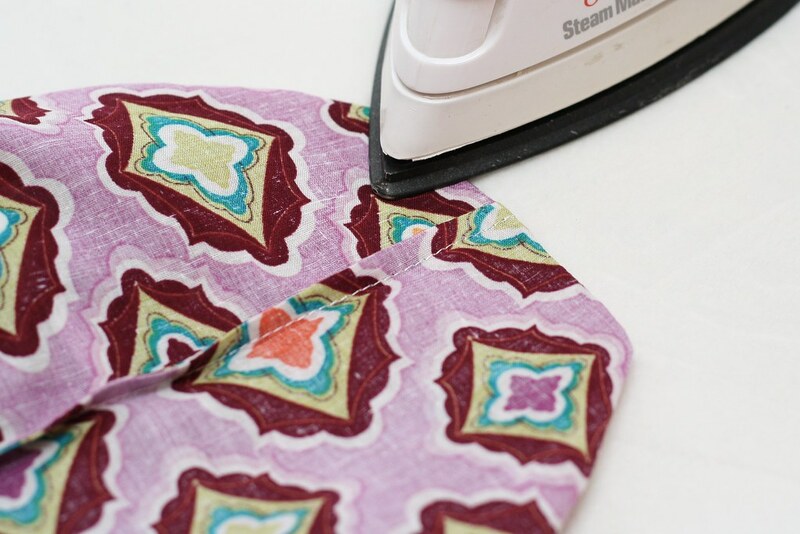 Fold your lining fabric into quarters and iron your folds. 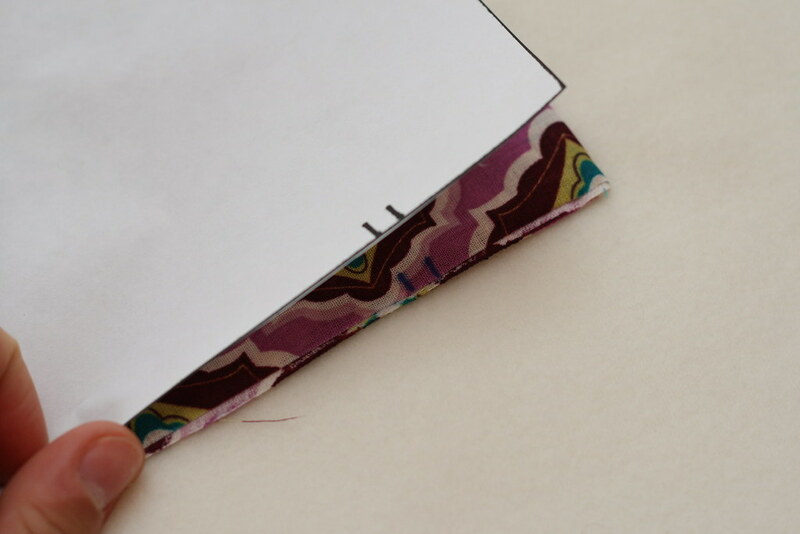 Line your pattern up on the fold, trace it and cut it out. 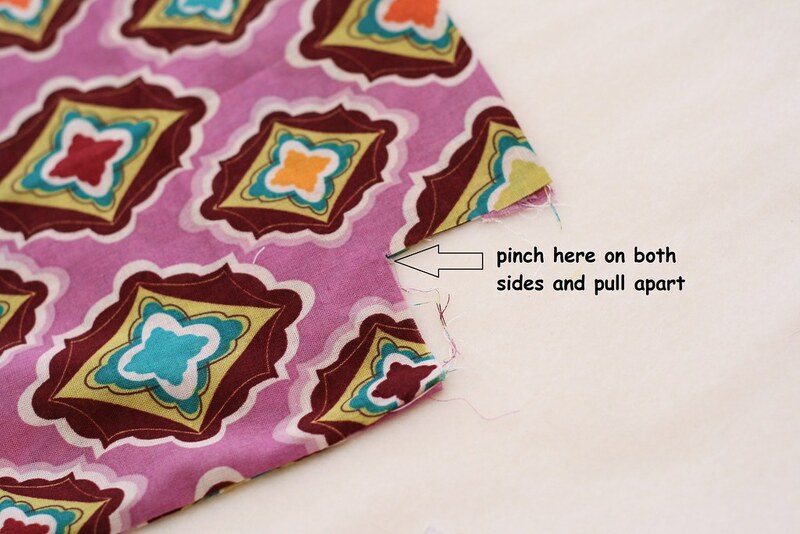 See those two small lines on the bottom of the pattern, copy those onto your fabric, you only need them on one side. 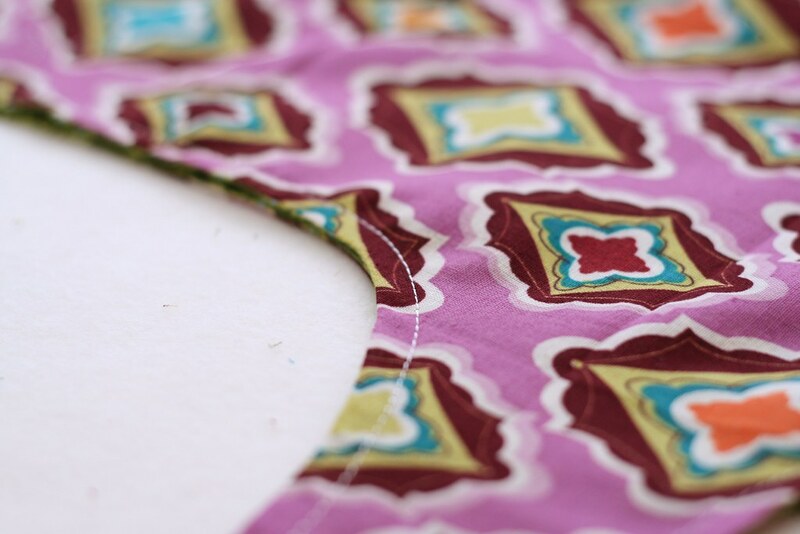 Finish the bottom edge of the lining. 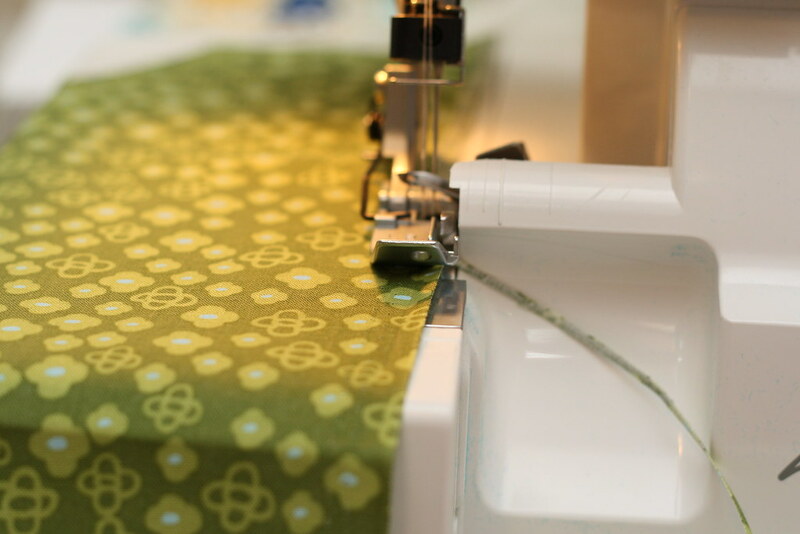 If you have a serger, across the edge. 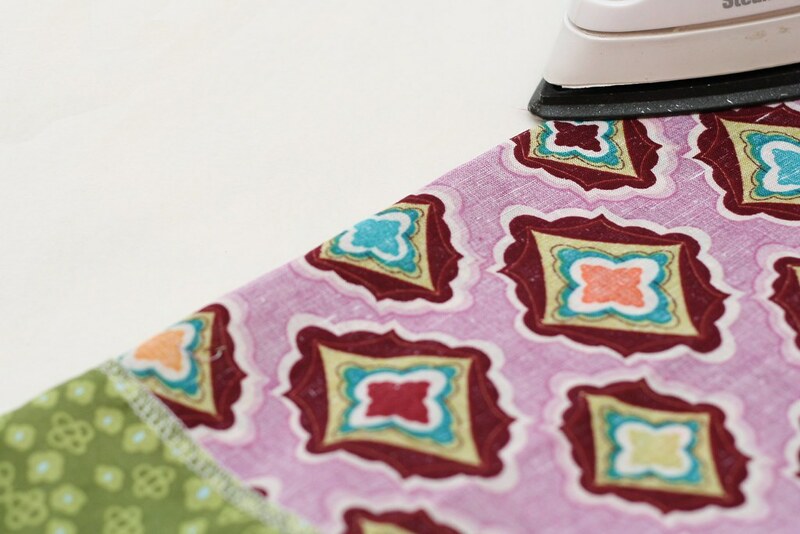 If you don't fold the edge up 1/4" on the wrong side of the fabric and iron, fold it up another 1/4" iron and then sew along the hem. 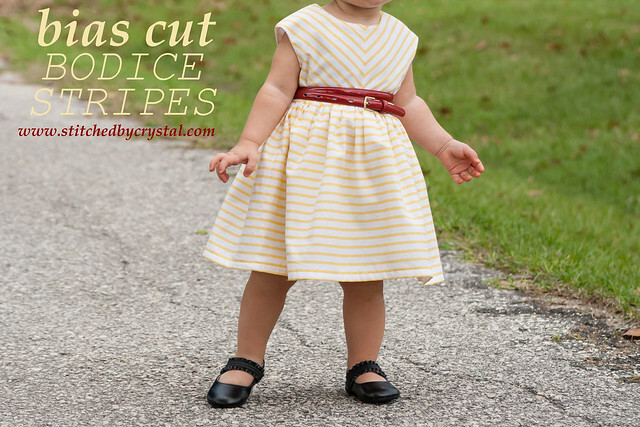 Cut little slits in the seam allowance along the curves, be careful not to snip your stitches. Turn one side of the bag right side out and iron the seams. Place it on top of the other side with the lining side up on both. Feed the top of the right side out one into the top of the inside out one. Line up the top of the handles and pin in place. Sew across the top of both handles, I like to go back and forth a few times so it is pretty strong. Now flip the other side right side out, your bags should be attached! Top stitch across the top of the handles, around the big circle in the middle and the curves on the outsides. 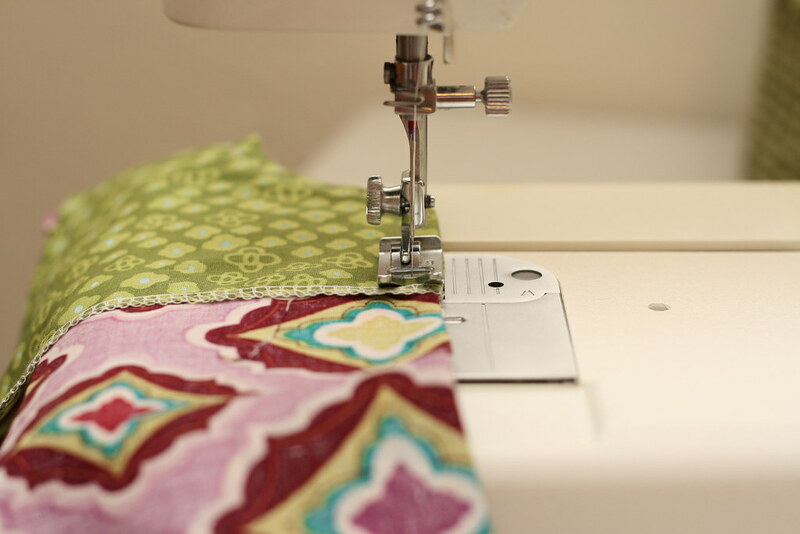 Line up the sides of your bag, you want the wrong sides together because you are going to make french seams. 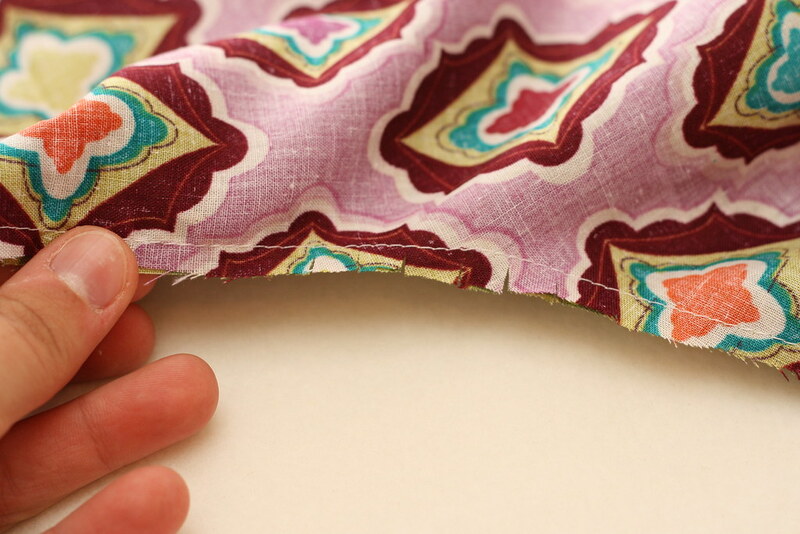 Pin the sides and sew them together with a 1/4" seam allowance. Do not sew the cut outs in the corners yet! 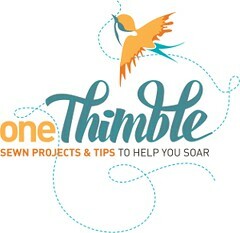 Trim your seam allowance on the bottom and sides to about 1/8". 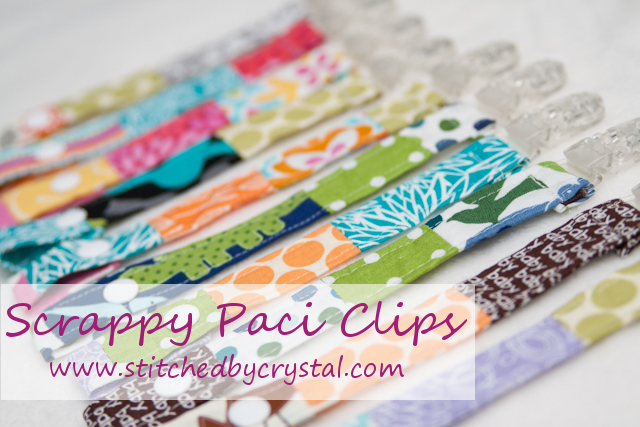 Be careful not to cut off the elastic you just sewed on! 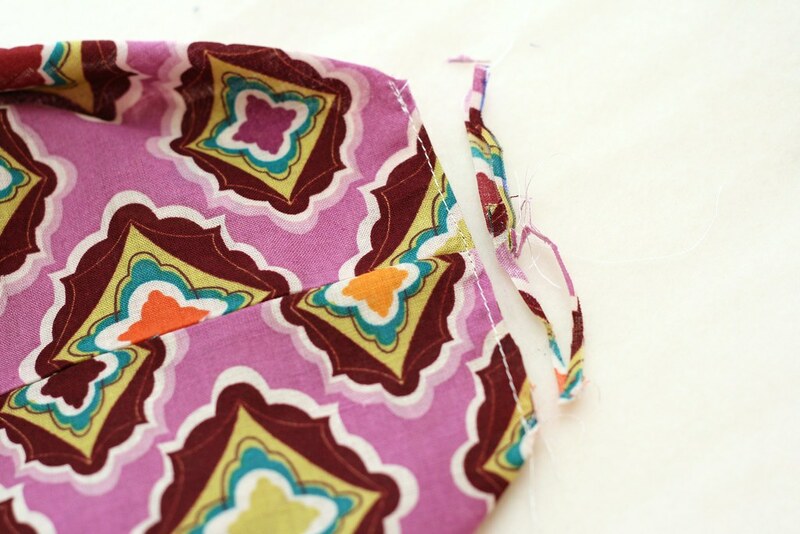 Sew along the sides again with 1/4" seam allowance. When you finish, your raw edges should be encased in the seam. Almost done! Now we will finish the corners... Flip the bag right side out again. Pinch at tho top corner of the corner cut out on both sides and pull the sides apart. It should go straight across now. Line up you side seams and pin in place. 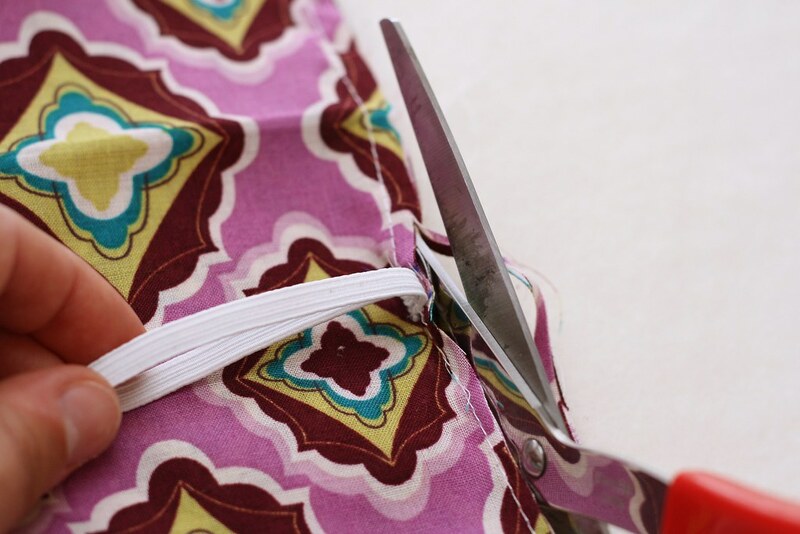 Sew across the corner and trim your seam allowance to 1/8". 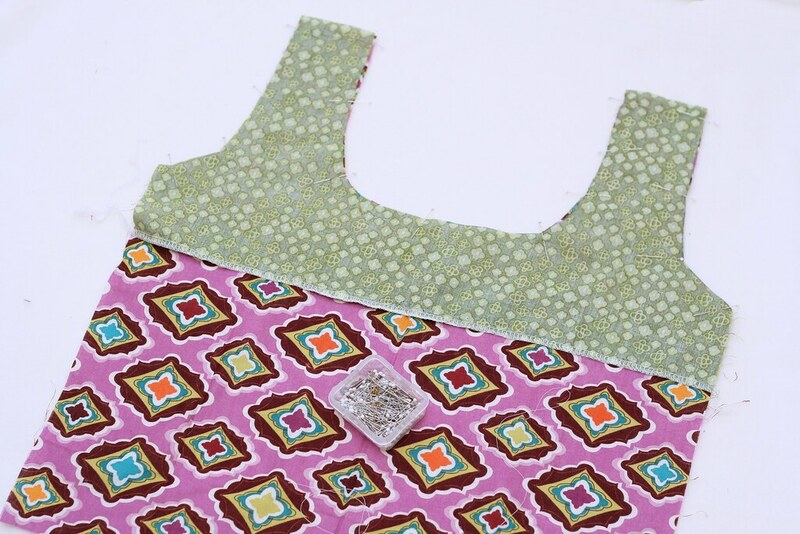 Flip your bag inside out, iron the corner seam and then sew over it with 1/4" seam allowance. Flip your bag right side out and you are done! 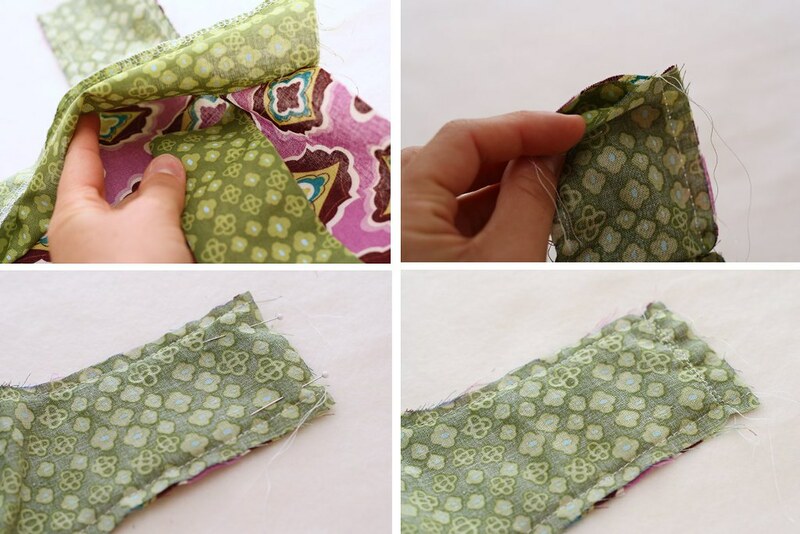 To roll up your bag: lay it flat, tuck the sides in and pull the bottom out, fold it in half and then in half again, start rolling from the handles, stretch the elastic around the rolled bag to keep it in place. I keep saying I'm going to make a bag! 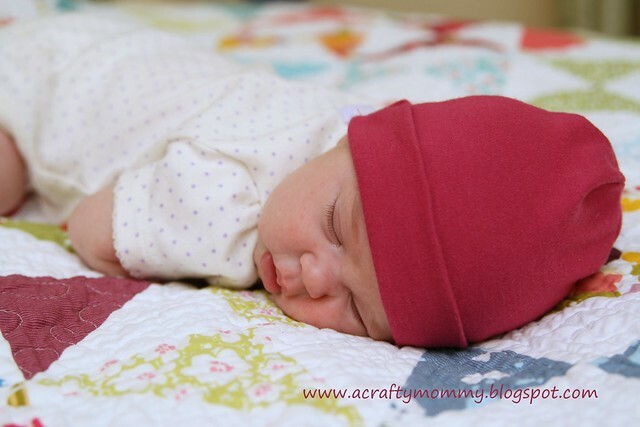 This one is so cute and i love your fabric! In love with the size and the use of the elastic too! Thanks for the pattern! Great little market bag! 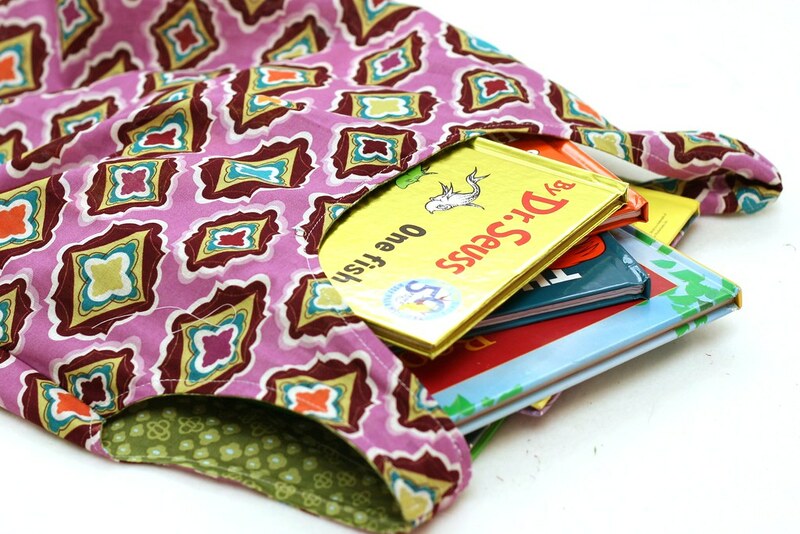 I made one this summer with friends and now am making 2 more for my granddaughters to carry their books to & from the library! Thanks for the tutorial! 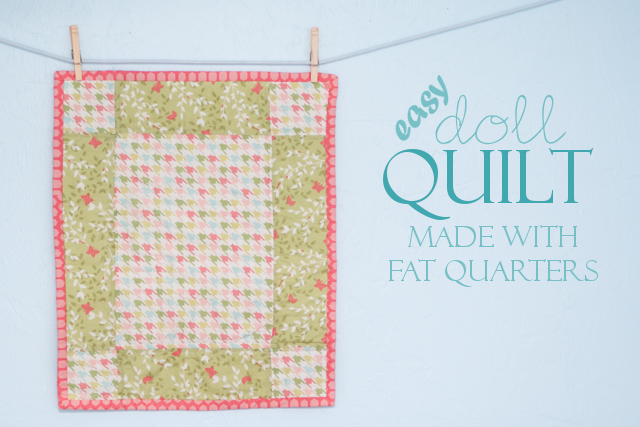 I am sending this link out to the ladies in my modern quilt guild. 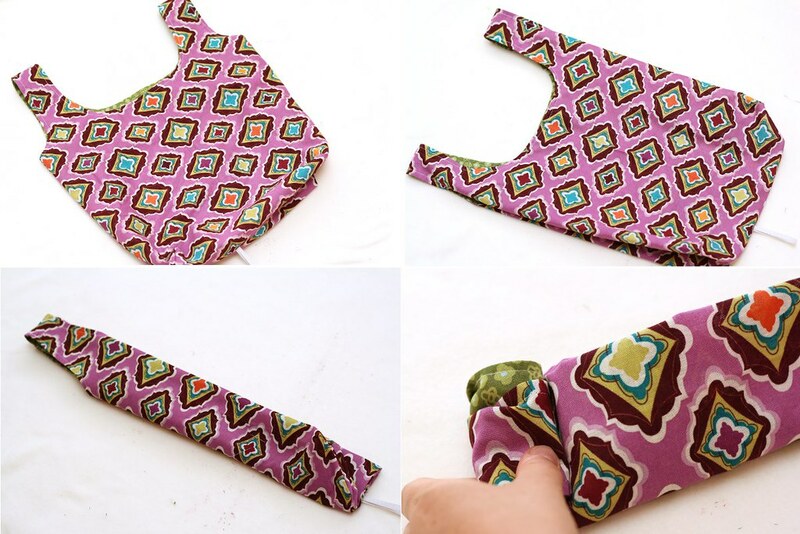 We are making reusable grocery bags for a donation effort, and so far this is the best tutorial I have found. Thanks for putting this together! Great bag. This bag was fast to make and turned out really well. I love the French seams--they look so professional! I'm planning to make several more to give as a Christmas gift to my mother-in-law, who lives in an area where plastic bags have recently been banned. Thanks so much for the detailed and easy to follow tutorial! Thank you for this tutorial. I have just sewn three bags for my children's teachers as Christmas presents. 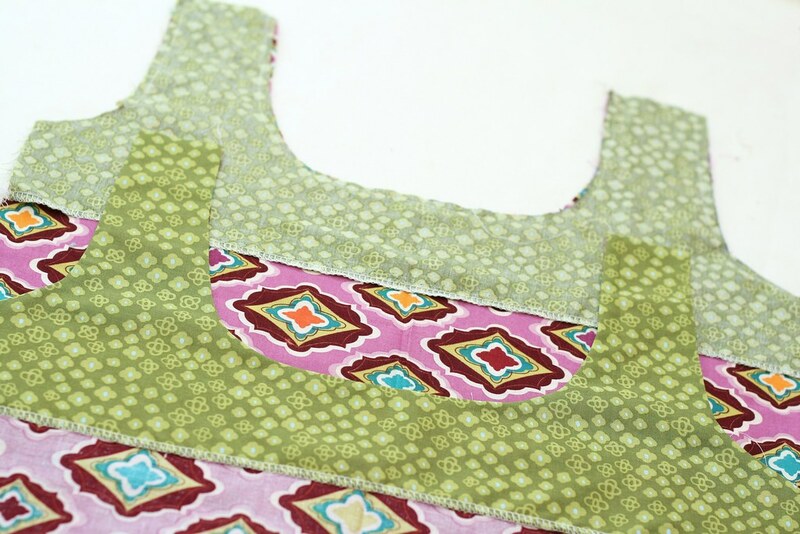 You can make it fully lined just by using the outside bag template for the lining fabric. I followed the same instructions too and it worked great! 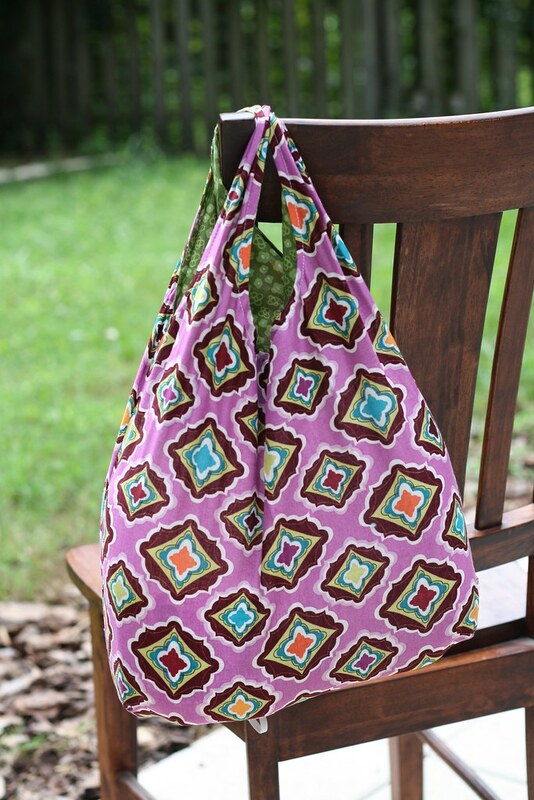 Hi crystal...i just finished making this shopping bag and i love it! 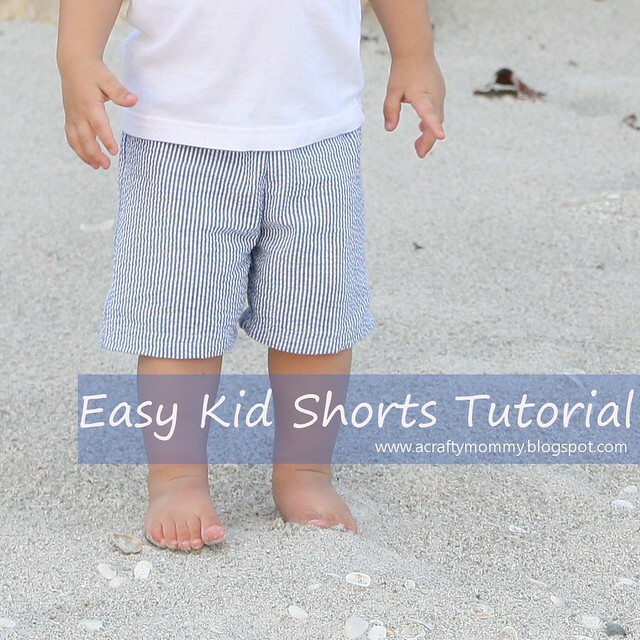 It was easy and quick and turned out awesome with no exposed seams. I didnt print off the pattern...i just drew it up from your pics. Thank you so much for posting this tutorial! Great pictures and directions! Thank you!! Super easy and practical!! This is a pattern I will be using over and over again! I modified it to become a fully lined bag as I was aiming for a sturdier library bag, and added a pocket on the outside for keys. Thank you so much for this amazing tutorial! God bless! I made one yesterday, then taught my girls at church how to make them last night. 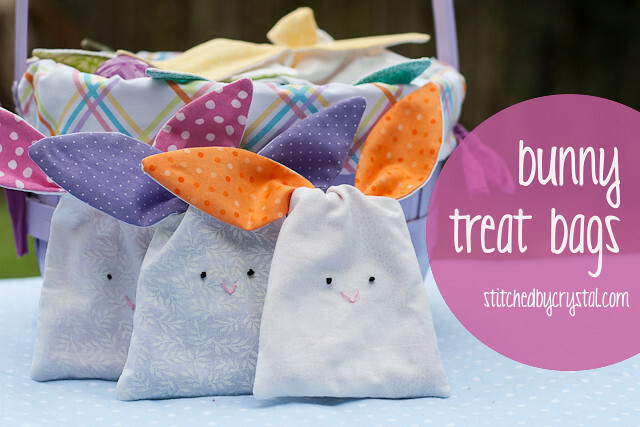 Such a cute bag and quite easy. Thank you!!! Nice tutorial. I like it, Thanks for sharing. That looks amazing! Thanks for your post. Does anyone know the finished size of this tote? Just made mine. Thanks for the tutorial. Awesome post!!! I am very interested in your blog. I am planning to start doing this one. Thanks for sharing. I am new to downloading patterns and using them. I made some burp cloths with a downloaded pattern (successfully) but the pattern did have a one inch block on it to make sure the printout was to scale. 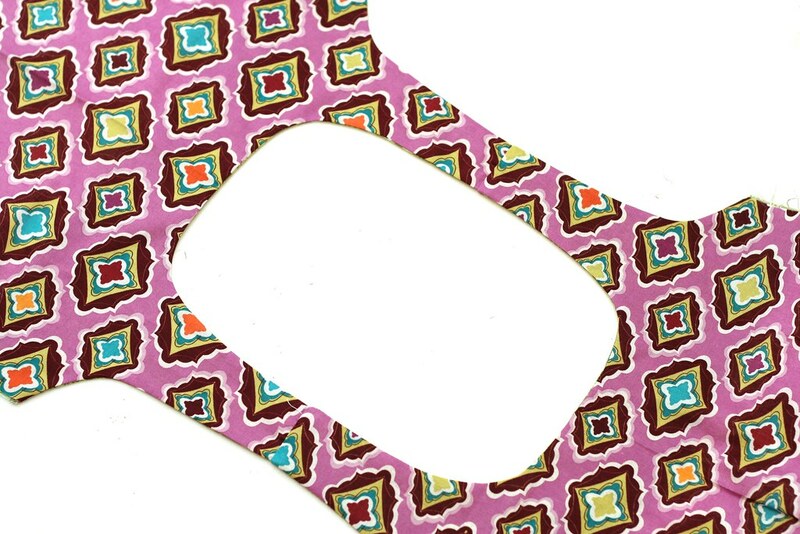 I downloaded your pattern, printed it, taped it together and cut it out. 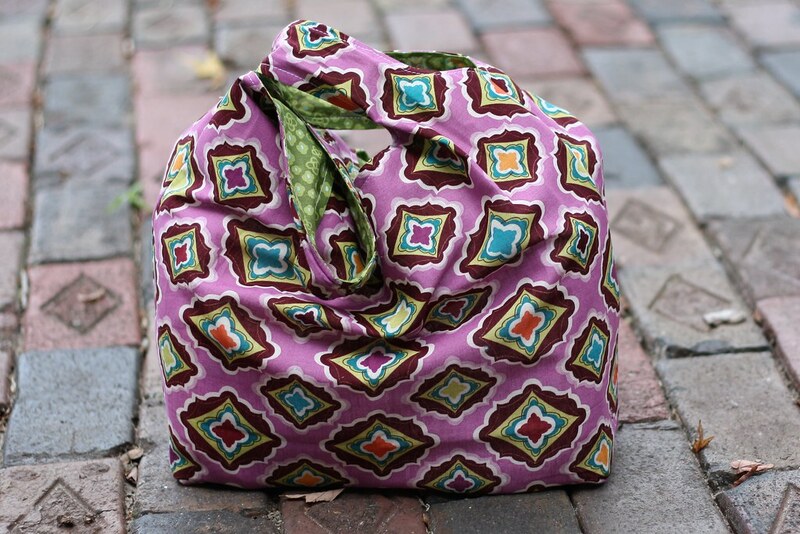 Unfortunately, the bag is very small--there was a lot of fabric around the pattern. I see that yours goes nearly to the edge of what I assume is a fat quarter. How do I adjust this pattern to try again? I sure would appreciate if anyone could help me with that. I do like the pattern and thanks for posting it. Awesome post!!! best for healthy life style also. I am very interested in your blog. 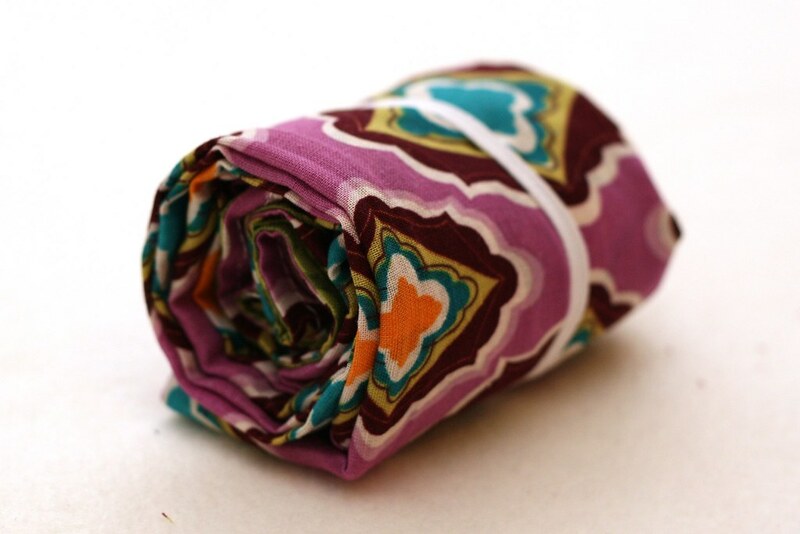 I made one today and now I want to make several more out of different fabrics. Thanks for the wonderful tutorial! I made these as Xmas gifts everyone loved them! My brother wants a larger one. Any I ideas on making this pattern bigger. Thinking of used jeans for this with seams exposed, hippy style.cut out the Pocket and sew to the bag. I have been making these recently and I love them. They're a great size and super strong! I'm going to try making a mini version now, we'll see how it goes. Thank you for the fabulous pattern and tutorial!!! 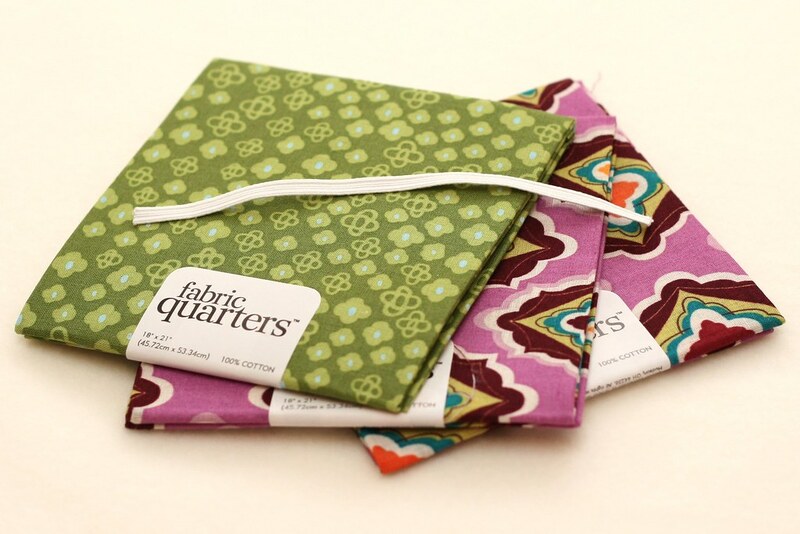 Did you pre-wash your fat quarters? Do I need to be worried about shrinkage if I don't pre-wash and end up having to wash the bag later? Check your print settings. You don’t want “fit to page”. Print full size. I did print size "100%" and when I taped it together, the pattern is longer than a fat quarter. Can you add a ruler or 1x1" square to the pattern? I also found mine was too small. I printed the pattern out 'landscape' and it was much bigger. I hope this helps. I cannot find the link for the template...Please help!!! I think my pages didnt print right, so mine came out kinda small. I'll probably use it as a lunch tote to take to work. Or if I ever need just a few things from the store. It came out pretty good though! I've never done French seams before so it was great to learn! I had the same problem, when you print be sure your printer is set at "actual size" and print horizontal and you will get the correct size pattern which is twice as big as my first bag! Thank you for a great pattern , my friends are asking me to make them some. I've made a dozen of these so far and given half away... have another six cut out and ready to sew. 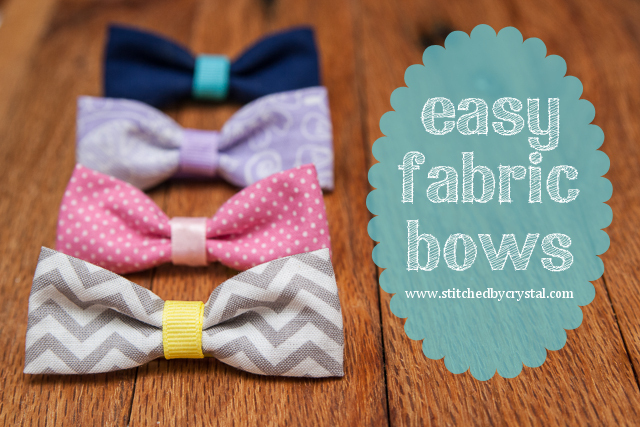 Passed long the link for this tutorial to several sewing friends as well. Love these grocery bags... they hold much more than a plastic bag because they're sturdier... cut the number of bags I needed for my first grocery run in half at least. Another benefit is that the handles do not cut into your arm while you're carrying laden bags into the house... yea! out of fruit or vegetable print fabric. Thank you! I made a couple for myself and loved them, I have now made a couple for quite a few of my friends. This bag is perfect to pop in your purse especially since they got rid of single use plastic bags in NSW. Nice bag making. The process is really so great. Can anyone break down the part where the handle are being sewn together for the 1st time?? I placed the sides on top of each other as instructed and fed the ride side one into the inside out one but once they were attached I couldnt get the inside one, right side out. I love the pattern!!! I just could figure our the handle part.. so instead I placed both sides right side out and sew the handles together at the top with wrong sides together and it just makes them look cluttered. I would love to learn how they are suppose to be done. Any help would be appreciated.